I don’t know what it is about tiny food that I love so much. Maybe it’s that it’s adorable. Maybe it’s that it’s delicious. Maybe it’s because I know my children are 97.8% more likely to eat something that’s tiny-sized. Probably that one. There have been a few strategies we’ve used as a family to help expand our little ones’ palates, and making small or individually-sized portions has been one of the most successful. 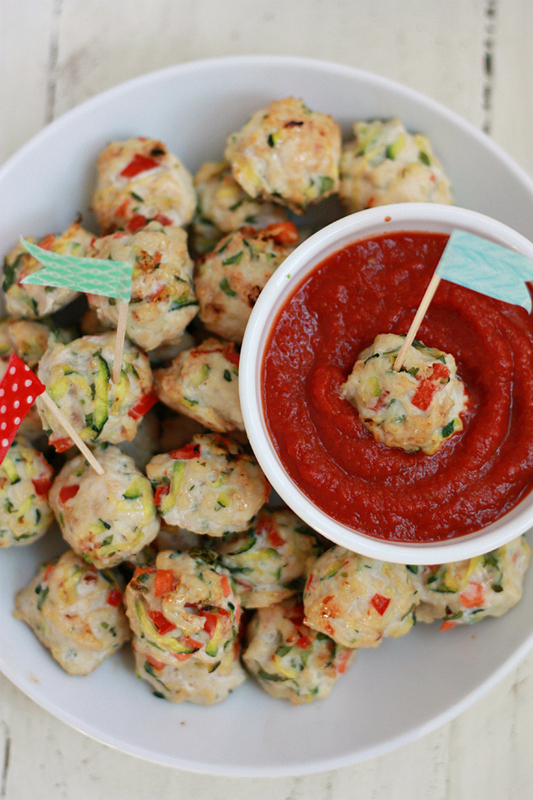 This Pesto Chicken Veggie Meatballs Recipe is the perfect size for little and grown-up eaters alike. You can certainly serve these atop a steaming pile of pasta (any shape will do) and smothered in your favorite sauce (Alfredo, marinara, pesto–it all works). 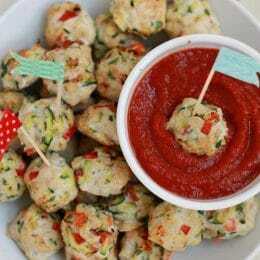 Our favorite way is to serve them with toothpicks and a dollop of your favorite pizza sauce on the side. This allows our toddlers to explore the new flavors at their own pace. It also helps with our daughter’s visual and tactile texture sensitivity. Letting her “mix” new foods as she’s ready feels much less overwhelming. She also tends to be more willing to try new foods when she has a sense of control. 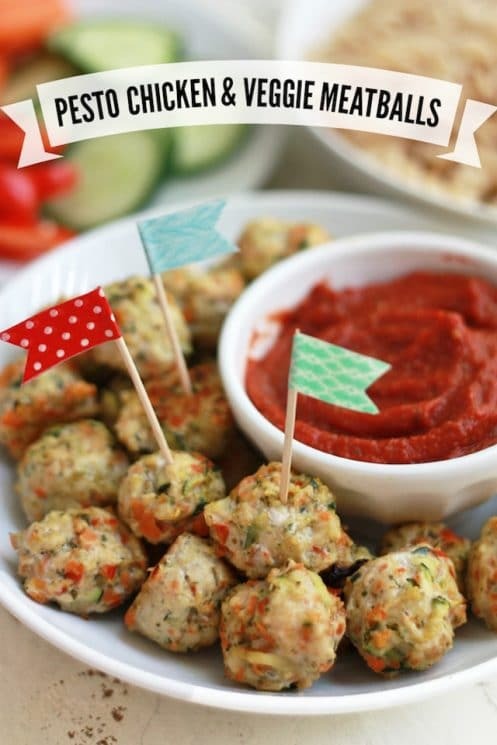 If your little ones like helping in the kitchen, this is a great way for them to jump in and help! 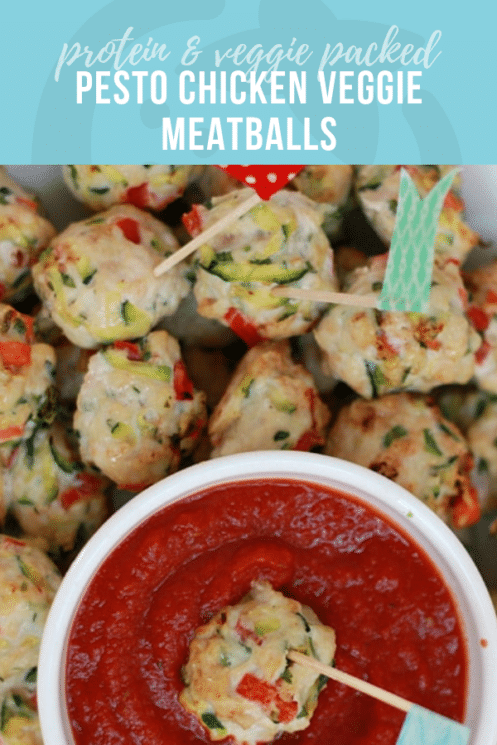 They can help stir the veggies as you chop them, scoop or roll meatballs and transfer them to your baking sheet or mat, drizzle olive oil, or help mix up the sauce while the meatballs bake. If you can’t find ground chicken breast at your local market, you can make your own by pulsing chicken breasts in a food processor fitted with a metal blade until they’re quite smooth and no large pieces remain. Ground turkey or beef would also work in this recipe. If you need a dairy and/or nut free pesto recipe, our favorite is this great recipe. It swaps raw pepitas (pumpkin seeds) for the pine nuts. It’s still just as delicious! Gently pat the zucchini dry with a paper towel or clean dish towel (no need to squeeze all the liquid out of it, just pat off some of the extra moisture). Add to a large bowl with the finely minced carrot and bell pepper. Add in the pesto, bread crumbs, and salt and stir to combine. Fold in the ground chicken breast using your hands or a large fork, and toss together the chicken and vegetable mixture until it’s well-combined. Try not to over-work the mixture. Line a baking sheet with foil or a slipat and drizzle with oil. Bake at 375 degrees for 10 minutes. For a bit of browning, broil the meatballs an additional 1-3 minutes. If browning isn’t important, continue baking meatballs another 2-3 minutes, or till cooked through. Serve with your favorite sauce, pasta, or on a sandwich. Enjoy! I found it difficult to fold the whole zucchini into the minced chicken. Are you supposed to grate it? Might want to specify that. What’s a “slipat”? Maybe an editor could help you polish it up. Justin – Yes, the zucchini is grated. Somehow that got missed in the directions. Thanks for the clear-up. As for the silpat, you’ll see a link and photo to one under the recipe. It’s a silicone baking mat. Hope that helps! Hi can you freeze them? And if yes, do you do this before baking?? This was great! I’ve been having trouble getting my 14 month old to eat much meat, but he gobbled this up! I omitted the pepper because I haven’t introduced that yet. I also just tossed the carrot in the food processor as well as Chicken breast. Super simple! Thanks! Just asking, are you guys using cooked chicken or raw? Dee, use raw ground chicken or turkey. This is the first recipe I have tried from this site…it was a hit! I grated the carrot along with the zucchini, the peppers have a slight crunch to them, I think the chopped carrott would have been a little too crunchy for my liking. I also used ground turkey cause it’s what I had on hand. Delish, and I will def make it again. I am so confused…ok, so the comments say raw meat, but that isn’t specified anywhere. Are we also using raw veggies? It sounds like the zucchini is supposed to be chopped and cooked? What about the carrots and peppers? Would love to try this weekend. Please clarify. My 10 month old loved these!!! I didn’t have zucchini so I added extra carrot and 1 stick of celery. I also added 1 egg yolk, bread crumbs, and mozzarella cheese and they stuck together well and were very moist! Hi – I don’t want to sound alarmist, but I would not recommend any parent of a toddler serve these with toothpicks as is suggested in the directions. These can be swallowed by very young children and are therefore dangerous. You should really rethink and alter the serving suggestions. The recipe itself sounds great but I would not serve these with toothpicks unless the children were 4 and up! Delicious! I served as a meatball subs topped with shredded Parmesan cheese and sauce! Made them today they are fabulous! We will see at dinner if my son will eat them. He helped with the veggies, I cute them up and he put them in the bowl. Even if he likes them or not I will made again for myself. Great to freeze and eat later too!! These were really good! Better than I even thought they would be! Whole family loved them. I put them in sauce and served them over pasta. I made them exactly as the recipe states and they were great! Might add some onion next time though. Just wanted to let people know my experience. Followed the recipe as best as I could understand it, but meatball stuff ended up way too mushy. I’ll call that first experiment sloppy joe medallions. I then proceeded to add bread crumbs to the rest of the batch, until the consistency seemed right. Second batch ended up way better and actually resembled meatballs. Thank you for the feedback! I just updated the recipe and added breadcrumbs. Yes! We freeze meatballs all the time! These taste good but how are you supposed to know when the chicken is cooked? I baked mine a lot longer than suggested because I could not tell. We like to use a meat thermometer. 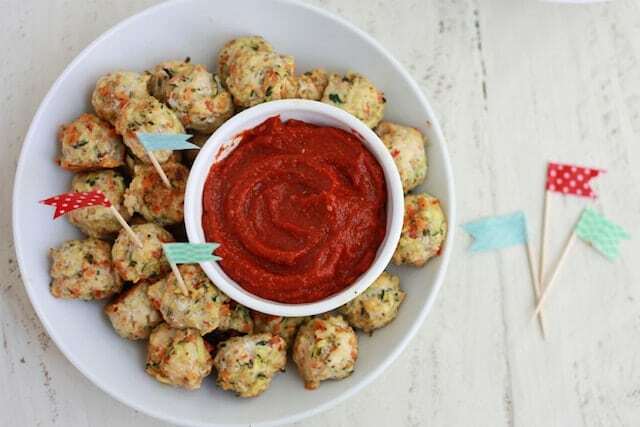 Ground chicken should be cooked to 165 degrees F.
Made the Chicken Pesto Meatballs – yummy & my 1 year old grandson ate them right up! Substituted onion for red pepper and used ground turkey instead. Also, I sautéed carrots, zucchini & onion first, then put in my food processor to make chop up finely. Made little meatballs for him and big meatballs for the adults!! Served with rotini pasta and homemade spaghetti sauce.